I have been searching for a couple books by David Bebbington and this one happened to arrive in the mail first. Bebbington is a Cambridge scholar who teaches in Scotland at the University of Stirling. 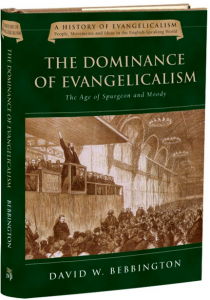 In this book he traces the rise of early evangelicalism in the UK and America during the rise of Liberalism at the end of the nineteenth century. As the subtitle points out, this was also the time of Spurgeon in the UK and Moody in the US. These two men only become examples (in this book) of evangelical preaching at a time when the established churches were becoming liberal and losing their effectiveness especially in evangelism. Bebbington begins with the Enlightenment era of the late eighteenth century and its continuing effects on liberal thought but most interesting in this chronology is the other precursor to liberalism, what he calls “The permeation of Romanticism.” It is interesting because I think it most closely parallels what we see happening today especially in postmodernism and its offshoot, the emergent church movement. Pertinent examples are the way Romanticism brought liturgical Anglo-Catholic preferences back into more evangelical services (such as the elevation of the host in the Eucharist). The result was dead spiritualism such as Transcendentalism and Unitarianism and parallel doctrines such as the Fatherhood of God, Evolution, and rationalism. What is also interesting to me is that the greatest deterrent to the weakening evangelicalism was a growing “back to the Bible” type fundamentalism especially seen in the prophetic Bible conferences which emphasized dispensationalism.